Are You Overfed and Malnourished At The Same Time… Leading to Obesity and A Host of Serious Issues Due to Chronic Deficiency and Toxicity? The human body requires up to 80 trace minerals for optimum health. It’s likely you won’t hear about this when visiting your family physician for a health check-up. You also likely won’t be informed that a serious problem began occurring around the beginning of the last century – mineral depletion of our soils, as we began stripping the top eight feet of soil of vital minerals our bodies require. Let’s face the fact, the majority of commercialized food we eat today has become horrendous, as food is stripped and void of most essential nutrients and essential minerals. At the same time, more toxins are added to the food to enhance shelf life and flavor, reduce costs, and at what expense? “You can trace every sickness, every disease, and every ailment to a mineral deficiency.” -Dr. Linus Pauling, two-time Nobel Prize winner. Modern-Day Farming And Soil That’s, 85% Deficient in Minerals. Observe how nature works in its natural state, and you’ll discover that there is a cycle of mineral replenishment. Tree roots go deep in the soil and bring up vital minerals. These minerals are replaced as the trees die and decompose. In addition, animals that eat and contain the minerals also die, decompose, and minerals are again returned to the soil. We have disrupted this natural cycle by over-farming virtually all of our soil without allowing time for micro-organisms to convert the remaining minerals into usable forms for plants. Petro-chemical fertilizers used today mostly return to the soil only petroleum derived nitrogen, potassium and phosphorous. These fertilizers produce lush growth but nutrient-poor plants. Pesticides and herbicides are being used today, and these also kill off vital micro-organisms that help convert remaining soil minerals to usable forms. In conclusion, the soil in the North American continent is now on average about 85% mineral depleted – the worst of any country in the world. You would have to eat about eight bowls of spinach today to get the nutrition of a single bowl of spinach that your grandparents consumed. Disease Is The Result of Malfunctioning Cells, Whether You Believe It Or Not. So What Building Blocks Do Cells Require to Function? Dr. Gary Price Todd has stated, “The lack of minerals is the root of all disease.” Whether you believe this statement or not isn’t the issue, it’s whether or not you are already affected by today’s modern epidemic of deficiency and toxicity and to what degree you are affected? Minerals are not a novelty or fad. Essential minerals are the most basic building blocks for proper nutrition and health. Without minerals, nothing else works. Amino acids and enzymes don’t work and vitamins and other nutrients don’t get broken down and absorbed properly. Thus we may end up with major deficiencies in both vitamins and minerals, compromising all bodily functions – including proper detoxification. Following this pattern, the end result is a chain reaction of poor health where nothing works as it should. Are You Always Hungry and Never Satisfied? Dehydration and mineral deficiency, manifesting as “insatiable hunger” and cravings… A confused signal response as the body’s cry for help? Without the proper balance of minerals, electrolytes, and vitamins, all systems are out of alignment in the body. A complete mineral solution will include electrolytes. Electrolytes are vital to one’s health and survival. They are positively charged particles (ions) that are formed when minerals and other salts dissolve and separate (dissociate) in water. Electrolytes carry a charge and can conduct electrical current in the water, which in its pure form is a poor conductor of electricity. The electrical current in the body enables electrolytes to regulate how and where fluids are distributed throughout the body, which includes keeping water from floating freely across cell membranes. These actions help maintain a state of fluid balance. Electrolytes transport nutrients into cells and wastes out of them. Electrical balance inside and outside of cells allows for transmission of nerve impulses, blood pressure control, contraction or relaxation of muscles, and proper gland functioning. Lastly, electrolytes determine the acidity or pH of some fluids, especially blood. Deficiencies in Electrolytes Can Become Life-Threatening, It’s All About Balance. An imbalance of electrolytes can become life-threatening and can occur if a person loses large amounts of fluids quickly through vomiting, diarrhea, excessive sweating, serious burns or wounds. On the positive side, a well-balanced diet full of ample amounts of five or more servings of fruits and vegetables per day (assuming there is nutritional value in these at the time of consumption) is assumed to provide enough supply of necessary electrolytes each day. Some experts recommend consuming sport drinks containing electrolytes for endurance events lasting more than an hour. A proper balance of minerals, electrolytes, and vitamins are a requirement for optimum health. One way to accurately test to see if you are meeting your requirements is to have a mineral test kit ordered online. In a few days, you can determine exactly where your levels are and adjust from there. Another option is to add Complete Ascentials™ Electrolyte PRO into your regimen and build gradually to replenish your mineral and electrolyte reserves in the body. 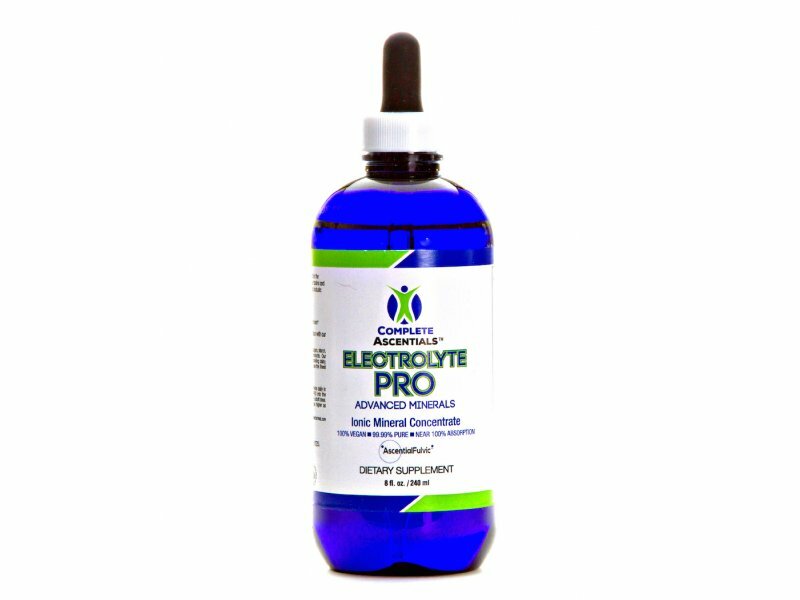 Electrolyte PRO is designed to work in conjunction with Complete Ascentials™ Magnesium for a complete-spectrum mineral base, in nearly 100% absorbable Ionic-form. Complete Ascentials™ Electrolyte PRO is a broad-spectrum Ionic-mineral supplement that is infused with our proprietary AscentialFulvic™ technology – CHD Fulvic-Acid to increase the overall value with anti-viral, anti-inflammatory, and anti-bacterial properties that have been clinically tested. AscentialFulvic™ reaches a step further in energizing the water with 6 Ancient Solfeggio Tones, including the 528Hz frequency (called the ‘LOVE’ frequency by Dr. Len Horowitz) used by biochemists for repairing DNA. Combine Complete Ascentials™ Magnesium with our Electrolyte PRO and our Beyond Whole Food Multi-Vitamin by purchasing our ‘Core Ascential Kit’, supporting the body with an Ionic-sized, nearly 100% absorbable, Complete Kit featuring 100% of your daily requirements of vitamins and minerals, in every daily serving. Each kit offers substantial savings and a plethora of value with the highest bioavailable minerals, and whole food sourced multi-vitamins. Each formula infuses the body with our proprietary AscentialFulvic™, and our kits provide a simple and effective solution to address deficiency and toxicity at the cellular level – The Complete Ascentials™ Core Ascential Kit.